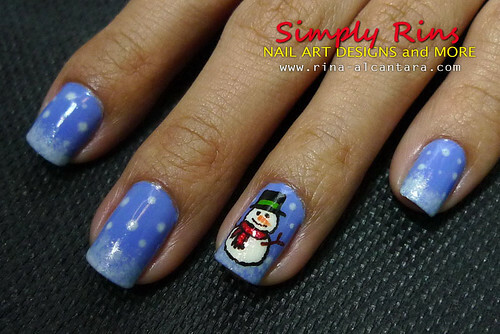 Here's my 2nd Christmas nail art -- a snowman! My first was the Christmas Nail Art: Gift Boxes that I entered in a nail art challenge. I'm sorry it took me awhile to post another Christmas nail design. I broke my thumbnail when I got back from a trip last month so I filed down all my other nails. I took this time to let my nails rest from nail polish in preparation for this month's project of coming up with Christmas nail art at least twice a week. This is 2 coats China Glaze Secret Peri-Wink-Le. Application was easy and opaque in 2 layers. I first thought of coming up with a design with the usual Christmas colors but I really wanted to paint a Snowman so I opted for a bluer shade for the base color. Again, I used my ring fingers as accent nails. This snowman has no name! I used the sponging technique to create the illusion of snow on the tips of my nails and randomly painted dots of different sizes to make it appear that it's snowing. 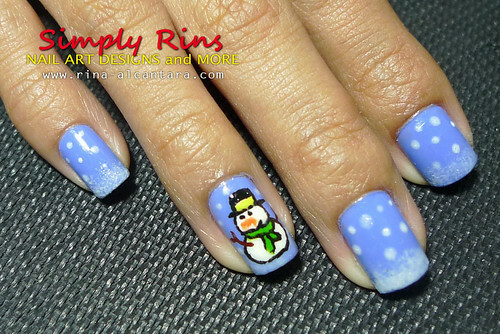 I personally think a snowman is a simple freehand nail art design. Paint 2 circles for the body, add a hat, a scarf, a pointed nose, and twigs for arms! I used different colors for the scarfs and hat accent. Sorry, the nose smudged when I applied a top coat. I guess I got excited and forgot to let everything dry completely first. We don't have snow here in the Philippines but it would be nice to able to experience making a snowman. I wonder how hard it is to make one. 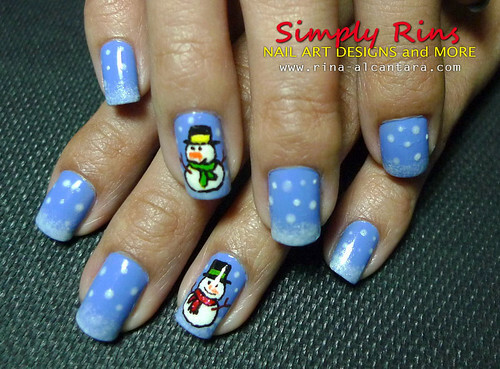 There may not be snow where I live, but it's snowing on my nails and I made 2 chubby snowmen! How cute and festive this is! mr. snowman looks very cute! Pity it doesn't snow where you live. Here (in Sweden) the ground is white right now and it has snowed for weeks. Really beautiful outside! I love it! I've got to do some holiday nails soon! That's too bad NorthernArtist. :( Snow without a chance to create a jolly snowman.